Without yeast and fermentation, no bread and no beer! 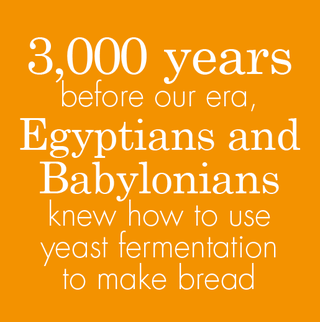 3,000 years before our era, Egyptians and Babylonians knew , using sourdough, how to utilise the fermentation of wild yeast to make alveolated bread different from the traditional, compact, flat cakes. The era of "mysterious fermentation" was to last until the 19th century when Pasteur identified yeast as the micro-organism responsible for alcoholic fermentation. in a fermentation tank , billions of cells which will enable the baker to initiate the complex mechanism of fermentation in dough which will be rapidly deprived of oxygen. he can also domesticate the existing strains by modifying or developing their genetic potential, and can create new and highly specialized yeast. This is an absolute necessity, as the baker requires more stable and more "process-tolerant" yeast on account of the technological evolution of bread-making and new consumption trends. Accept the pH variations of sourdough and osmotic pressure in sweet dough; tolerate fungistatic agents for the sandwich-loaf shelf life; survive negative cold inside a frozen lump of dough - such is the ordeal the yeast must get though in the baker’s kneading machine. And that is not the end of it ! After giving all his attention to the properties of the dough and its tolerance until it is put into the oven, today the baker has rediscovered the taste of bread which only a long and well monitored fermentation can produce. Are essential secondary fermentations possible without having to use the laborious techniques required by sourdough or poolish methods to develop the flavour of bread ? It is the challenge facing yeast makers and requires that yeast can produce unchanged carbon dioxide associated with an accelerated synthesis of the aromatic volatile substances. a Dutchman, Antonie van Laeuwenhoek. In 1860, Pasteur proved that fermentation is caused by living organisms and asserted that the agents which are responsible for the reaction are connected with the yeast cell. He then showed that yeast can live with or without oxygen, multiplying in the first case, causing a fermentation in the second case. "high" (Saccharomyces cerevisiae). But it became impossible with another sort of yeast, called "low" (Saccharomyces carlsbergensis). Thus, in 1780, Dutch distillers put on the market a yeast specially designed for bread making. 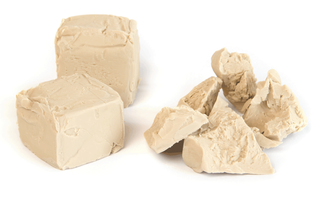 The manufacturing process of this yeast is therefore quite naturally called the Dutch process. From Holland, the process passed on to Germany. It appeared in Hanover around 1800, with the foundation of a factory at Lücke. 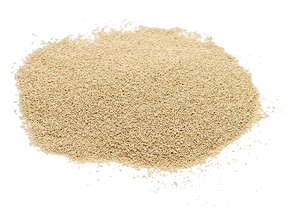 In 1825, the yeast producer Tebbenhof made a compressed yeast for the first time. Before that date, yeast was sold in the form of cream. Tebbenhof had the idea to compress it to extract water and sell it in blocks. It is still in this form that it is sold nowadays. The press-filter which noticeably improved the industrial process was developed in 1867. 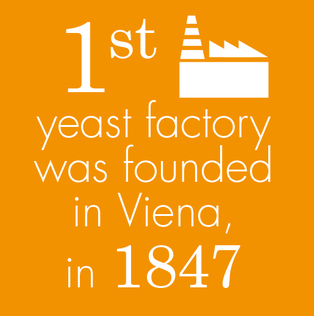 The baker’s yeast Viennese production process also dates back to 1867. It is the acknowledged starting point of the yeast history. Reiminghaus, who started out at Lücke, developed in Mautner’s factory a manufacturing process which made it possible to deliver an industrial yeast of good quality at a reasonable price. The process, at the time still empirical, consisted in preparing a grain wort in such a way that carbon dioxide gas transfer drove yeast onto the surface where it was collected. After filtering, yeast was first washed in cold water, and collected into a large tank before being dried up in screw-presses or in press-filters. It was then sent out in small drums, bags or briquettes. In 1872, Baron Max de Springer, from Vienna, founded in France the first French grain yeast manufacture, followed by Lesaffre and Bonduelle. The yeast made with the Viennese process rapidly prevailed over the French market. All the research carried out improved the knowledge of the yeast industry and therefore led to constant improvement, particularly in the elimination of risks of contamination, in judicious choice of raw materials, in fermentation monitoring and improvement of finished products. In 1883, Emile Hansen from Carlsberg Laboratory, introduced the pure culture based on two principles: bacteriological purity during the initial seeding and the same purity during the manufacturing process. The wood of the tanks was then replaced by sterilized enameled metal, then by copper in the 1920’s, and finally by stainless steel. The latter has been used by everybody since the 1960’s. Another big progress was the introduction of centrifugal separators which replaced manual collection of yeast. 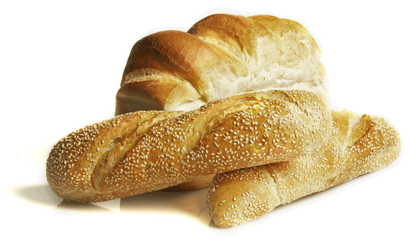 The first separator of yeast was brought into service in 1892, in Berlin. Continuously operating machines were introduced afterwards. Research oriented itself also toward the choice of raw materials. From 1900 till 1935, researchers studied the replacement of cereal-based culture environment (55% malt, 30% barley and 15% rootlets) by molasses (completed with nitrogen of ammonia and phosphorus), more easy to use and less expensive. Much progress has been made in the fabrication of yeast since World War II. Particularly, in the industrial domain, the old intermittent press-filters were replaced by continuous rotary filters under vacuum. Thus the last stage of the manufacturing process was dramatically improved in quality and quantity. Thanks to them, industrial producers got a better mastery of the washing process of yeast. Besides, filtration time itself is reduced down to some seconds and the content of dry materials in yeast is precisely regulated. the yeast with the growth of the latter. In that way, there is never any surplus of sugar left in the wort, which avoids undesired formation of alcohol. Modern fabrication of yeast is still based on this principle. Since then, it has improved a great deal thanks to a better knowledge of raw materials and yeast biology, as well as process automation. COFALEC is the confederation of yeast producers that represents the EU yeast industry in Europe. With 33 factories scattered through the European Union, one million ton of yeast produce each year and more than 30% of the production exported outside Europe, the yeast industry is an important player of the European food industry. 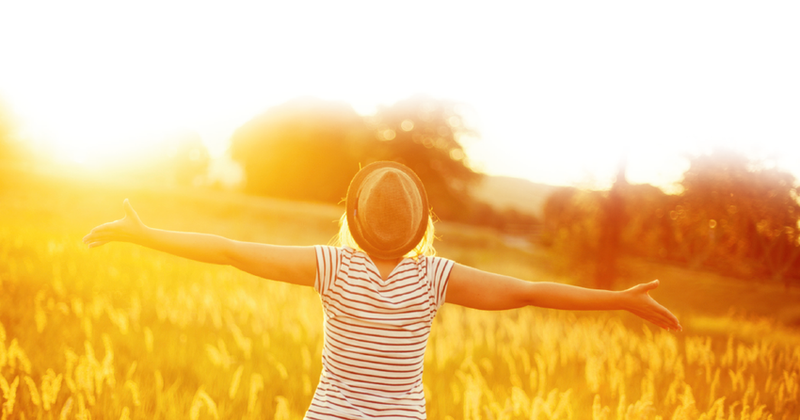 Yeast is a natural living micro-organism used in traditional fermented products (bread, wine, beer) and more recently in human and animal health (probiotics).